The Bank of Korea’s Financial Information Promotion Association is planning to establish infrastructures to make mobile debit cards as South Korean Government has put out a policy that will reduce commission from debit and credit cards. It is going to establish joint QR code standards and apply them to small business pay (zero pay) with ‘almost 0% commission’. It is going to adopt a slogan of app to app payment method and ultimately aim for ‘VAN LESS’ payment system, which is expected to be introduced during the first half of 2019. The Bank of Korea’s Financial Information Promotion Association voted on a plan that will introduce mobile direct payment service based on bank accounts. This association is composed of 28 financial consultative bodies such as commercial banks and relevant organizations and its executive office is held by The Bank of Korea’s Financial Payment Office. The Bank of Korea is going to introduce QR code-based mobile payment service by utilizing current joint network of cash cards. This service allows owners of affiliated stores of direct payment cards and customers to exchange payment information by installing a Smartphone application, and payment is withdrawn and paid from an account of a buyer. The Bank of Korea’s goal is to invigorate direct payment card payments. According to The Bank of Korea, number of affiliated stores of cash cards was estimated to be 123,000 at the end of 2017 and it corresponded to about 5% of number of affiliated stores of credit cards (2.5 million). Because direct payment cards do not go through VAN (Value Added Network) companies or PG (Payment Gateway) companies, commission rates are between 0.3 and 1%. These rates are lower than that of credit card (2.1%) and check card (1.6%). 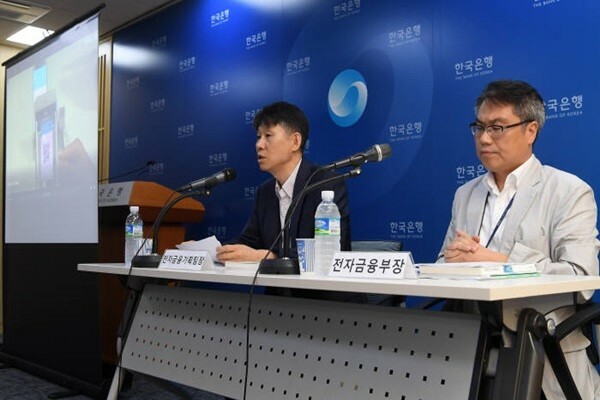 The Bank of Korea’s is going to form a working group for mobile direct payment service under Financial Information Promotion Association and prepare standards in September. Development of necessary platforms will start in November after voting takes place in October. However, The Bank of Korea still needs to come up with solutions on how it is going to attract people from using direct payment cards more after credit card deduction has been postponed by a year due to revision of tax law by South Korean Government.